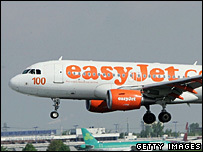 Budget airline Easyjet is urging its passengers to oppose plans to introduce a security charge at Liverpool John Lennon Airport. Passengers will have to pay a £2 fee to pass through ticket barriers before entering security from 1 January. Airport bosses said it will help meet the cost of increased security measures brought in this year, but Easyjet said it already pays for security services. The firm said passengers should boycott the airport to avoid paying twice. It is launching an advertising campaign in the next few days, asking people to "Say NO to Liverpool John Lennon Airport Security Charge". Andy Harrison, Easyjet chief executive, said: "Liverpool Airport is acting improperly by trying to double charge the airlines' customers for something that we have already paid for and we will not let them do it. "We will not allow our passengers to be charged just to benefit Peel Airport Holdings. "Liverpool Airport's strapline is 'Above us only sky', but 'Help! I need somebody to improve my bottom line' is more appropriate." Security was increased at UK airports in August after an alleged plot to blow up planes using liquid explosives.